Tags: crusaders, event, gardener, galaxy, 2018. Gardeners of the Galaxy Vol. 3 runs until Tuesday, June 5th at 12:00pm PDT. 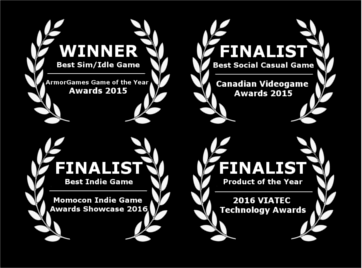 For more information, check out the How to Play / FAQ in-game! I am Broot. He's big, he's buff, he's shirtless and purple-skinned: Rex the Wrestler has joined Crusaders of the Lost Idols! Rex is a male support Crusader who takes trophies from slain enemies, occasionally selling them on the black market to enable buffs for the party. And did we mention the body paint? Also we're pretty sure he's invisible. If you haven't collected them already, you can unlock our Tier One Crusaders Broot and Robbie Raccoon by completing the respective Tier One objectives. I am Broot. Then, you can collect the Tier Two Crusaders, Spaceking and Grandmora, by completing the first two Tier Two objectives! Recruit Rex the Wrestler | Rex the Wrestler takes up a slot in the formation. He moves around every 25 areas and buffs global DPS by 100% for each Champion from the Gardeners of the Galaxy event in the formation. Reach area 500. Just Plain Crazy | Only those Crusaders with a penchant for insanity can be used: Hermit, Princess, Khouri, Merci, Nate, Pete, Momma Kaine, Kyle, Metal Soldierette, Broot, Robbie, Ilsa, Mindy, Cindy, Squiggles, Spaceking, Grandmora, Thoonoose, and of course, Rex. Reach area 600. Mix Tape | Enemy Cassette Tapes attack the formation, each "playing" a different song debuff. Debuffs last until the cassette is killed. All cassettes survive for at least 1 second. Reach area 650. 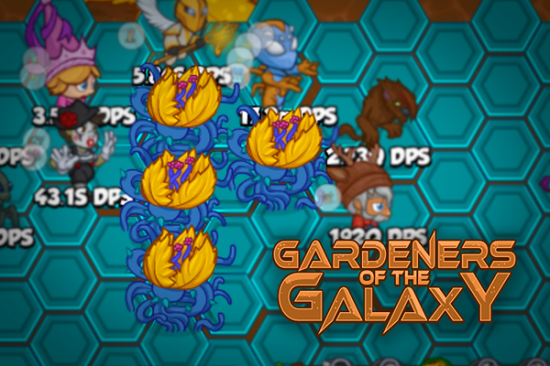 Potted Garden | Three slots in the formation are taken up by potted plants, each one debuffing you in some way. Reach area 700. 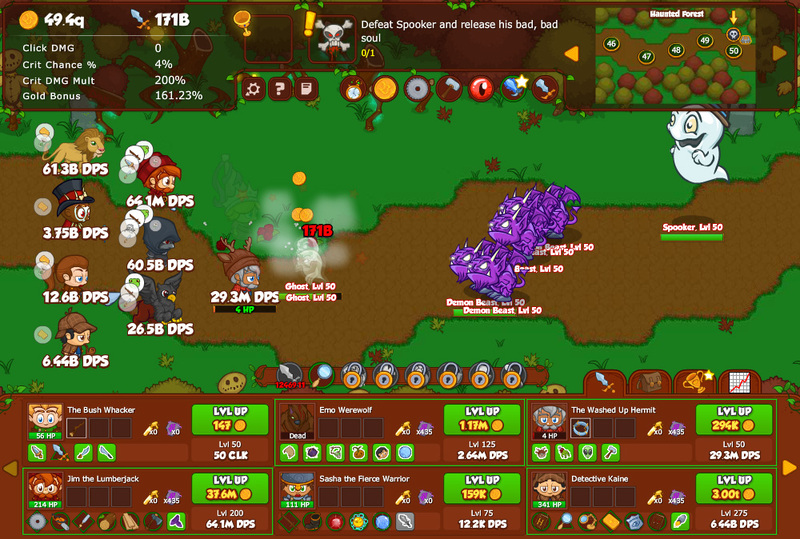 Bug Out | Bug enemies spawn randomly, and each time one is killed, it reduces the DPS of a random Crusader by 50% for 60 seconds and creates a glowing purple cloud over them. This effect stacks additively if it the same Crusader is chosen multiple times. Reach area 750. 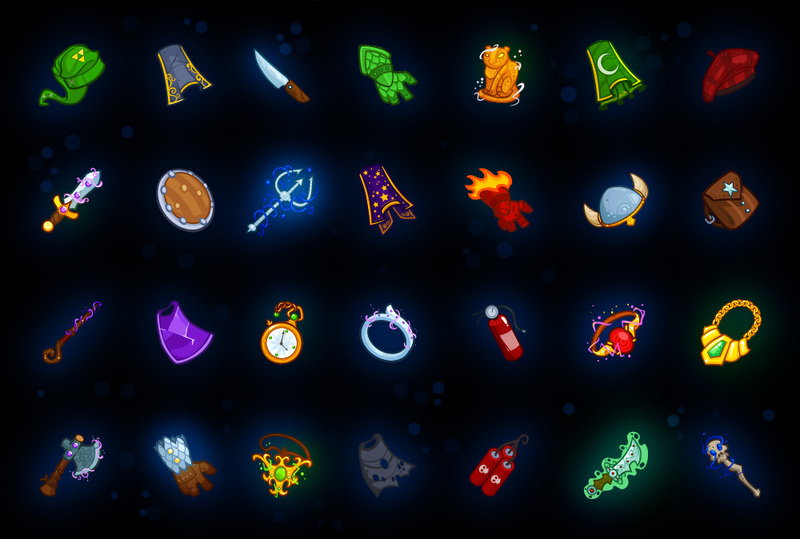 Equipment for event Crusaders can be found in Gardeners Jeweled Chests, which you can earn from objectives and the free play or buy in the shop. I am Broot. Each non-recruitment objective will drop a chest for its given tier of Crusaders, and free play will drop all-tier chests. I am Broot. Gear for the Tier 2 and 3 Crusaders will only appear in all-tier chests once you've unlocked the respective Crusader. You can select the tier of chest you buy in the shop. 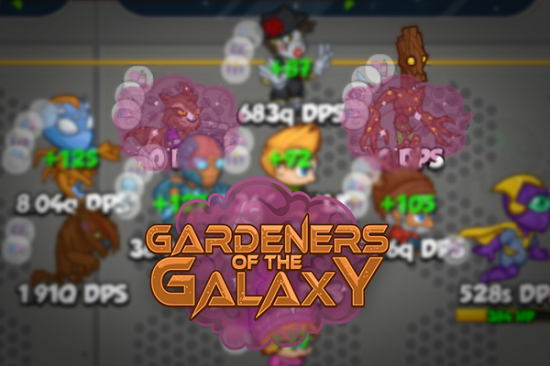 You'll have until Tuesday, June 5th at 12:00pm PDT to complete Gardeners of the Galaxy Vol. 3! Tags: gardeners, galaxy, 2017, event, new, Crusaders, Tier, 2, two. I am Broot. Plus, the giant galaxy destroying plant is back, so there's that. Nate and the gang require more help to defeat the interplanetary flora interloper. Two new Tier Two Crusaders need to be recruited during this updated event. 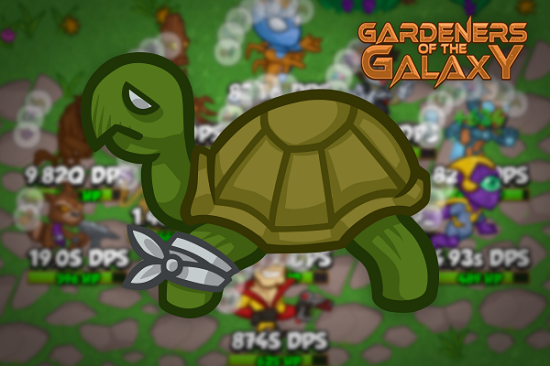 Gardeners of the Galaxy event runs from today through to May 9th at Noon PDT. For those players who haven't unlocked them already, this is your chance to add both Broot and Robbie the Raccoon to your roster. Two new Tier Two Crusaders are also available to unlock once you've completed the Tier One objectives: Spaceking and Grandmora. New Tier Two Crusader: Spaceking. The first of the two new Tier 2 Crusaders is Spaceking who'd put Zapp Brannigan to shame with his lascivious behaviour and penchant for melodrama. At level 150, his ability Kirkin' It Up increases his DPS +100% for every alien Crusader in the same formation. 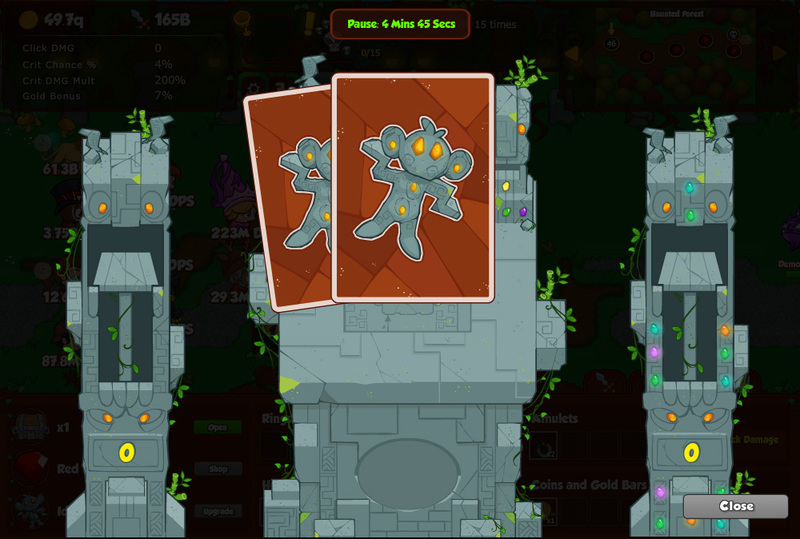 At level 400, Spaceking unlocks Avenger which increases his DPS +100% for each dead Crusader in the formation. New Tier Two Crusader: Grandmora. Grandmora is the ageing grandmother of intergalactic being, Thermos. She's an expert in knitting warm, ugly clothes and her insistence on feeding the other Crusaders makes her an ideal support Crusader. At level 50, Grandmora unlocks Still Suspicious, an ability that Buffs all Crusaders in the column in front of her by 200%, divided by the number of Crusaders in the column behind her. Grandmora unlocks Untrusting at level 150, the ability buffs all Crusaders in the column behind her by 50%, multiplied by the number of Crusaders in the column in front of her. After you've completed the first new Tier Two objectives for Spaceking and Grandmora, there are three galaxy-sized new Tier Two objectives to complete. New Tier Two Objective: Out of Control. In Out of Control, a rapidly growing plant starts in just one formation slot, but spreads to a new formation slot every 50 areas, eventually encompassing all formation slots until you beat area 400. New Tier Two Objective: Raid. In the objective, Raid, two clouds of toxic spray float around the formation, moving to a random adjacent slot every 10 seconds. 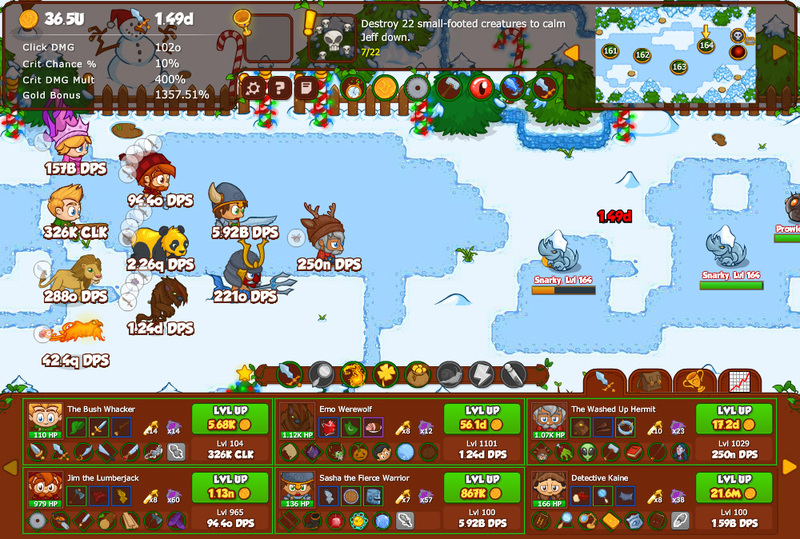 The Crusaders in the affected slots have their DPS reduced to zero and formation abilities disabled. New Tier Two Objective: Slow and Steady. The final new Tier Two objective is Slow and Steady. Every time a monster is killed, every Crusader in your formation takes 5% of their max health as damage. They naturally heal 20% damage every 5 seconds all the way to area 500. 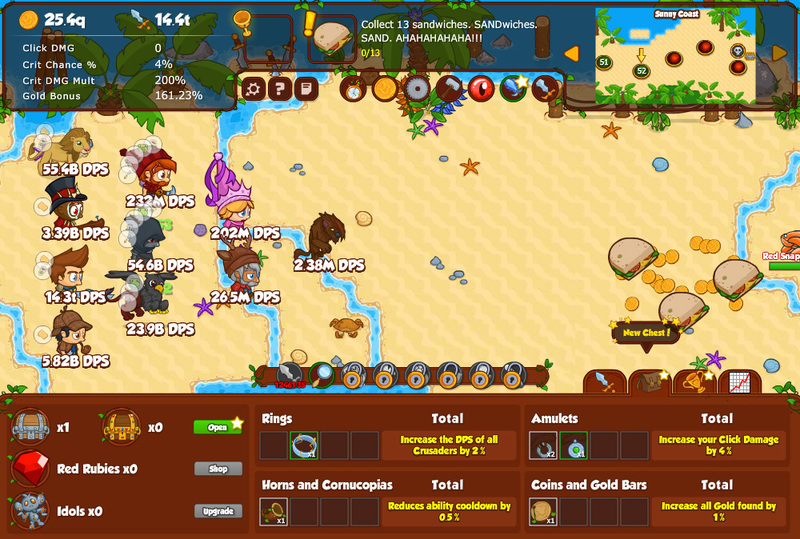 Equipment for both Tier 1 and 2 Crusaders can be found in Gardener's Jeweled Chests. However, gear for the Tier 2 Crusaders will only appear once you've unlocked the respective Crusader. You'll have until May 9th at Noon PDT to complete the event.